Harram, or Harran was the name of a man, and a place, related to Abraham. Haran, the man, was the son of Terah, brother of Abraham and Nahor, and father of Lot. Haran, the place, was a city in northwestern Mesopotamia (today Iraq) just east of the Euphrates River. It is now in SE Asian Turkey, 24 mi (39 km) SE of Sanlurfa. It is the place Abraham lived after leaving his birthplace, Ur Of The Chaldees (today, southern Iraq), prior to entering what was to become the land of Israel (Abraham's grandson Jacob was renamed Israel, by God). In Roman times it was Carrhae. It was an important center on the trade route from Nineveh to Carchemish and the seat of the Assyrian moon god. The Babylonians defeated the Assyrian army at Haran in 609 B.C. 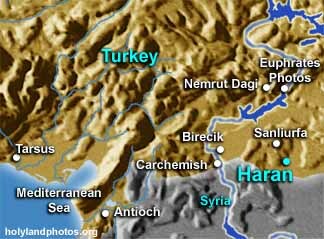 Frequently mentioned in the Bible, Haran was the home of Abraham's family after the migration from Ur. Abraham's father, Tereh, took his family and left Ur to go to Canaan - however he settled in Haran along the way. After Tereh died, God called Abraham to go to Canaan. Abraham, his wife, Sarah, and lot went south to Canaan, while Abraham's brother Nahor stayed in Haran. When Isaac was at the age to marry, Abraham sent his servant to Haran where he arranged for Nahor's granddaughter, Rebekah, to be Isaac's wife. During the next generation, it was Jacob, Isaac's son, who fled to Haran from his brother Esau after stealing the birthright, and worked for Laban (son of Nahor, Abraham's brother) to marry Rachel and Leah. 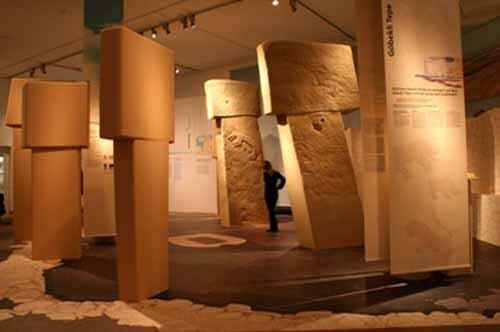 he earliest records of Harran come from the Ebla tablets (c. 2300 BCE). From these, it is known that an early king or mayor of Harran had married an Eblaite princess, Zugalum, who then became "queen of Harran", and whose name appears in a number of documents. It appears that Harran remained a part of the regional Eblaite kingdom for some time thereafter. Royal letters from the city of Mari on the middle of the Euphrates, have confirmed that the area around the Balikh river remained occupied in ca. the 19th century BCE. 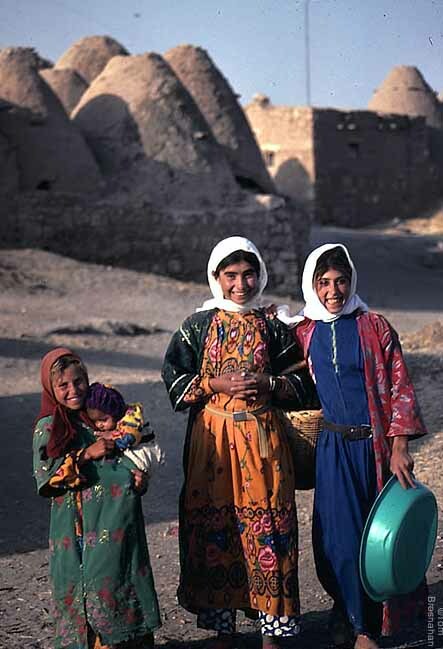 A confederation of semi-nomadic tribes was especially active around the region near Harran at that time. 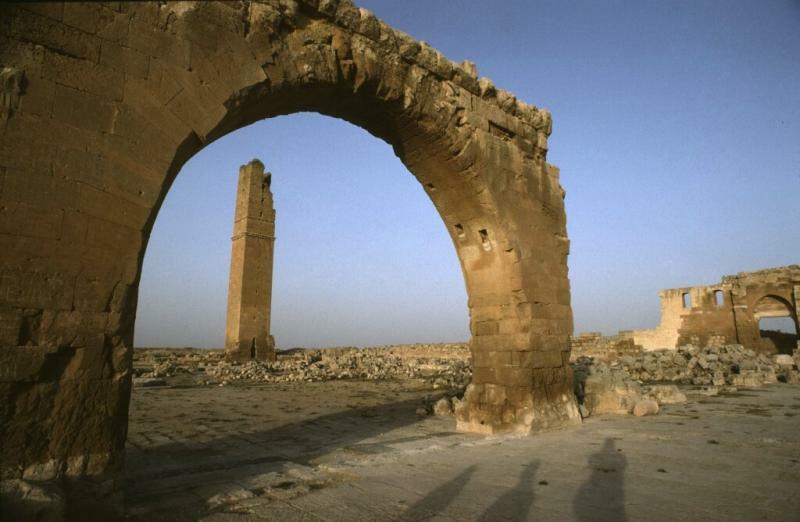 By the 19th Century BCE, Harran was established as a merchant outpost due to its ideal location. The community, well established before then, was situated along a trade route between the Mediterranean and the plains of the middle Tigris. It lay directly on the road from Antioch eastward to Nisibis and Ninevah. The Tigris could be followed down to the delta to Babylon. The fourth century Roman historian Ammianus Marcellinus (325/330-after 391) said, "From there (Harran) two different royal highways lead to Persia: the one on the left through Adiabene and over the Tigris; the one on the right, through Assyria and across the Euphrates. "Not only did Harran have easy access to both the Assyrian and Babylonian roads, but also to north road to the Euphrates that provided easy access to Malatiyah and Asia Minor. According to Roman authors such as Pliny the Elder, even through the classical period, Harran maintained an important position in the economic life of Northern Mesopotamia. In its prime Harran was a major Assyrian city which controlled the point where the road from Damascus joins the highway between Nineveh and Carchemish. This location gave Harran strategic value from an early date. Because Harran had an abundance of goods that passed through its region, it became a target for raids. In the 18th century, Assyrian king Shamshi-Adad I (1813 - 1781 BCE) launched an expedition to secure the Harranian trade route. After the Suppiluliuma I-Shattiwaza treaty (14th century BCE) between the Hittite Empire and Mitanni, Harran was burned by a Hittite army under Piyashshili in the course of the conquest of Mitanni. In the 13th century BCE, Assyrian king Adad-Nirari I reported that he conquered the "fortress of Kharani" and annexed it as a province. It is frequently mentioned in Assyrian inscriptions as early as the time of Tiglath-Pileser I, about 1100 BCE, under the name Harranu (Akkadian "road, path; campaign, journey"). Tiglath-Pileser had a fortress there, and mentioned that he was pleased with the abundance of elephants in the region. 10th century BCE inscriptions reveal that Harran had some privileges of fiscal exemption and freedom from certain forms of military obligations. It had even been termed as the "free city of Harran". However, in 763 BCE, it was sacked by a Harranian rebellion against Assyrian control that resulted in the loss of those privileges. Not until Sargon II restored order, in the late 8th century BCE, were those privileges restored. During the fall of the Neo-Assyrian Empire, Harran became the stronghold of its last king, Ashur-uballit II, who had retreated from Nineveh when it was sacked by Nabopolassar of Babylon and his Median allies in 612 BC. Harran was besieged and conquered by Nabopolassar and Cyaxare in 610 BC. It was briefly retaken by Ashur-uballit II and his Egyptian allies in 609 BC before it definitely fell to the Medians and Babylonians. The last king of the Neo-Babylonian period, Nabonidus, also originated from Harran as substantiated by evidence from the temple of stele of his mother Adad-Guppi, who is suspected by some to be of Assyrian origin. The city became a bastion for the worship of the moon god during the rule of Nabonidus from 555-536 BC, much to the consternation of the city of Babylon in the south where Marduk remained the primary deity. Harran became part of the Median Empire after the fall of Assyria, and subsequently passed to the Persian Achaemenid dynasty in the 6th century BCE. It became part of the Persian province of Athura, the Persian word for Assyria. The city remained in Persian hands until 331 BCE, when the soldiers of the Macedonian conqueror Alexander the Great entered the city. After the death of Alexander on June 11, 323 BCE, the city was contested by his successors: Perdiccas, Antigonus Monophthalmus, and Eumenes visited the city, but eventually it became part of the realm of Seleucus I Nicator, of the Seleucid Empire, and capital of a province called Osrhoene (the Greek rendering of the old name Urhai). For one and a half centuries the town flourished, and became independent when the Parthian dynasty of Persia occupied Babylonia. The Parthian and Seleucid kings were both happy with a buffer state, and the dynasty of the Arabian Abgarides, technically a vassal of the Parthian "king of kings", was to rule Osrhoene for centuries. The main language spoken in Oshroene was Aramaic, and the majority of people were Christian Assyrians. In Roman times, Harran was known as Carrhae, and was the location of the Battle of Carrhae in 53 BCE, in which the Parthians, commanded by general Surena, defeated a large Roman army under the command of Crassus, who was killed. Centuries later, the emperor Caracalla was murdered here at the instigation of Macrinus (217). The emperor Galerius was defeated nearby by the Parthians' successors, the Sassanid dynasty of Persia, in 296 CE. The city remained under Persian control until the fall of the Sassanids to the Arabs in 651 CE. At the beginning of the Islamic period Harran was located in the land of the Mudar tribe (Diyar Mudar), the western part of northern Mesopotamia (Jazira). Along with ar-Ruha' and Ar-Raqqah it was one of the main cities in the region. During the reign of the Umayyad caliph Marwan II Harran became the seat of the caliphal government of the Islamic empire stretching from Spain to Central Asia. It was allegedly the Abbasid caliph al-Ma'mun who, while passing through Harran on his way to a campaign against the Byzantine Empire, forced the Harranians to convert to one of the "religions of the book", meaning Judaism, Christianity, or Islam. The pagan people of Harran identified themselves with the Sabians in order to fall under the protection of Islam. Aramaean and Assyrian Christians remained Christian. Sabians were mentioned in the Qur'an, but those were a group of Mandaeans (a Gnostic sect) living in southern Mesopotamia. The relationship of the Harranian Sabians to the ones mentioned in the Qur'an is a matter of dispute. The Harranians may have identified themselves as Sabians in order to retain their religious beliefs. During the late 8th and 9th centuries Harran was a centre for translating works of astronomy, philosophy, natural sciences, and medicine from Greek to Syriac by Assyrians, and thence to Arabic, bringing the knowledge of the classical world to the emerging Arabic-speaking civilization in the south. Baghdad came to this work later than Harran. Many important scholars of natural science, astronomy, and medicine originate from Harran; they were non-Arab and non-Islamic ethnic Assyrians, including possibly the alchemist Jabir ibn Hayyan. The Harranian school drew from many resources, they had their roots in Chaldea and schools of the Magi; they harbored priceless Greek scrolls and which would have otherwise may have been lost. They were influenced by Judaism, Christianity and Islam. They revered Hermes Trismegistus as their prophet and the Corpus Hermeticum as their holy book. Hermes Trismegistus was believed to be an ancient great Egyptain sage, perhaps Imhotep, who as the founder of writing and the author of many books on science, medicine, theology, ethics, astrology, alchemy and magic. In the Hermeticum we have his teaching in the form of mystic visions, He has been equated with the Greek god Hermes, and the Egyptian god Thoth or Tehuti, but the Hermeticum portrays a divinely inspired teacher. He has also been equated with Enoch in the Bible, and Idris in the Koran. Through the Hermeticum's monotheistic teachings, the Harranians where able to claim themselves as one of the "People" of the book, though Sabian might have actually referred more to the Mandaians of Iraq, who are followers of John the Baptist. In 1032 or 1033 the temple of the Sabians was destroyed and the urban community extinguished by an uprising of the rural, starving 'Alid-Shiite population and impoverished urban Muslim militias. In 1059�60 the temple was rebuilt into a fortified residence of the Numayrids, an Arab tribe assuming power in the Diyar Mudar (western Jazira) during the 11th century. The Zangid ruler Nur al-Din Mahmud transformed the residence into a strong fortress. During the Crusades, on May 7, 1104, a decisive battle was fought in the Balikh River valley, commonly known as the Battle of Harran. However, according to Matthew of Edessa the actual location of the battle lies two days away from Harran. Albert of Aachen and Fulcher of Chartres locate the battleground in the plain opposite to the city of ar-Raqqah. During the battle, Baldwin of Bourcq, Count of Edessa, was captured by troops of the Great Seljuq Empire. After his release Baldwin became King of Jerusalem. At the end of 12th century Harran served together with ar-Raqqah as a residence of Kurdish Ayyubid princes. The Ayyubid ruler of the Jazira, Al-Adil I, again strengthened the fortifications of the castle. In the 1260s the city was completely destroyed and abandoned during the Mongol invasions of Syria. The father of the famous Hanbalite scholar Ibn Taymiyyah was a refugee from Harran, settling in Damascus. The 13th century Arab historian Abu al-Fida describes the city as being in ruins. 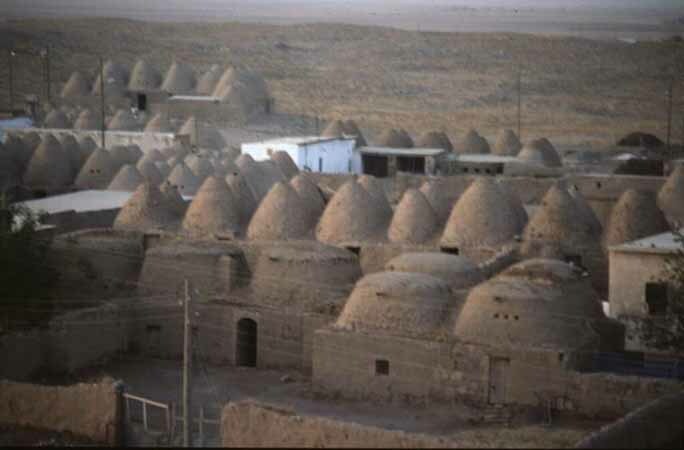 Harran is famous for its traditional 'beehive' adobe houses, constructed entirely without wood. The design of these makes them cool inside (essential in this part of the world) and is thought to have been unchanged for at least 3,000 years. Some were still in use as dwellings until the 1980s. However, those remaining today are strictly tourist exhibits, while most of Harran's population lives in a newly built small village about 2 kilometres away from the main site. At the historical site the ruins of the city walls and fortifications are still in place, with one city gate standing, along with some other structures. Excavations of a nearby 4th century BC burial mound continue under archaeologist Dr Nurettin Yard�mc�. The new village is poor and life is hard in the hot weather on this plain. The people here are now ethnic Arabs and live by long-established traditions. It is believed that these Arabs were settled here during the 18th century by the Ottoman Empire. The women of the village are tattooed and dressed in traditional Bedouin clothes. The Assyrians who once occupied the area for thousands of years have moved to other areas, although there are some Assyrian villages in the general area. By the late 1980s the large plain of Harran had fallen into disuse as the streams of C�llab and Deysan, its original water-supply had dried up. But the plain is irrigated by the recent Southeastern Anatolia Project and is becoming green again. Cotton and rice can now be grown. The city was the chief home of the Mesopotamian moon god Sin, under the Assyrians and Neo-Babylonians/Chaldeans and even into Roman times. According to an early Arabic work known as Kitab al-Magall or the Book of Rolls (part of Clementine literature), Harran was one of the cities built by Nimrod, when Peleg was 50 years old. The Syriac Cave of Treasures (ca. 350) contains a similar account of Nimrod's building Harran and the other cities, but places the event when Reu was 50 years old. The Cave of Treasures adds an ancient legend that not long thereafter, Tammuz was pursued to Harran by his wife's lover, B'elshemin, and that he (Tammuz) met his fate there when the city was then burnt. The pagan residents of Harran also maintained the tradition well into the tenth century AD, of being the site of Tammuz' death, and would conduct elaborate mourning rituals for him each year, in the month bearing his name. However, the Islamic historian Al-Masudi in his Meadows of Gold (ca. 950), as well as the Christian historian Bar Hebraeus (13th c.), both recounted a legend that Harran had been built by Cainan (the father of Abraham's ancestor Shelah in some accounts), and had been named for another son of Cainan called Harran. Sin's temple was rebuilt by several kings, among them the Assyrian Assur-bani-pal (7th century BCE) and the Neo-Babylonian Nabonidus (6th century BCE). Herodian (iv. 13, 7) mentions the town as possessing in his day a temple of the moon. Harran was a centre of Assyrian Christianity from early on, and was the first place where purpose-built churches were constructed openly. However, although a bishop resided in the city, many people of Harran retained their ancient pagan faith during the Christian period, and ancient Mesopotamian/Assyrian gods such as Sin and Ashur were still worshipped for a time. In addition the Mandean religion, a form of Gnosticism, was born in Harran. Premedieval Harran has been closely associated with the biblical place Haran. Very little is known about the premedieval levels of Harran and even less for the patriarchal times. (Lloyd and Brice)  Scholars have yet to see what physical evidence will link this villiage of Harran to the biblical site that Abram and his family encamped at as mentioned in Genesis 11:31,32; 12:4,5. Biblical Haran was where Terah, his son Abram (Abraham), his grandson Lot, and Abram's wife Sarai settled while in route to Canaan, coming from Ur of the Chaldees (Genesis 11:26�32). The region of this Haran is referred to variously as Paddan Aram and Aram Naharaim. Genesis 27:43 makes Haran the home of Laban and connects it with Isaac and Jacob: it was the home of Isaac's wife Rebekah, and their son Jacob spent twenty years in Haran working for his uncle Laban (cf. Genesis 31:38&41). The place-name should not be confused with the name of Haran Abraham's brother and Lot's father - note that the two names are spelled differently in the original Hebrew. Islamic tradition does link Harran to Aran, the brother of Abraham. Prior to Sennacherib's reign (704-681 BCE), Harran rebelled from the Assyrians, who reconquered the city (see 2 Kings 19:12 and Isaiah 37:12) and deprived it of many privileges - which King Sargon II later restored. T. E. Lawrence ("Lawrence of Arabia") surveyed the ancient Harran site. Decades later, in 1950, Seton Lloyd conducted a three-week archaeological survey there. An Anglo-Turkish excavation was begun in 1951, ending in 1956 with the death of D. S. Rice. Haran was the chief home of the moon-god Sin, whose temple was rebuilt by several kings, among them Assur-bani-pal and Nabonidus, and Herodian mentions the town as possessing in his day a temple of the moon. In the middle ages it is mentioned as having been the seat of a particular pagan sect, that of the Haranite Sabians, into the period of the Crusades, although it also possessed a bishop over a Christian community. In 1104 it was the site of a battle between the Crusaders and the Seljuk Turks. This city retained its importance down to the period of the Arab ascendancy; but the 13th century Arab historian Abulfeda describes it as having fallen into decay before his time. In the late nineteenth century, it was in ruins. This group of Pagans carried on the ancestral traditions, which go back to the days of the Sumerian Empire. It is these Pagans of Harran who managed to acquire, preserve and transmit the Hermetica.